In the millennium year the Torrs Gorge was made passable for walkers by the construction of the spectacular Torrs Millennium Walkway. It has been described as ’a steel spiders web’ as it stands on stilts above the River Goyt and is partly cantilevered from the sheer stone railway embankment, reputed to be the ‘finest retaining wall in the country’s rail network’. Completed in 1999, the walkway provides a link in Europe’s premier walking route, E2 which passes through New Mills on its way from Stranraer in Scotland, via Dover, to Nice in France. 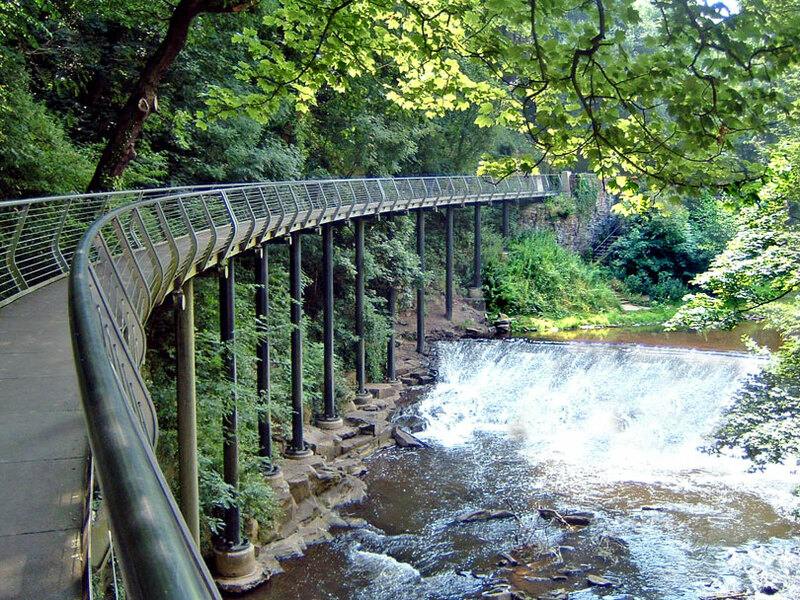 The walkway provides a route through the previously impassable gritstone gorge at Torrs, New Mills which is an area of exceptional natural beauty and unique industrial archaeological heritage. An elevated 160m long cantilevered walkway provides the important ‘missing link’ for the Mid Shires Way, allowing people to walk the whole scenic, 275 mile trail.